The DJI is a fantastic all-purpose drone, but with the EXO 1 exoskeleton, it becomes a dedicated search and rescue tool. The 3D-printed add-on quickly attaches to the drone and adds a host of features key to making the drone a valuable tool for first responders. There are GoPro mounting points at various locations around the exoskeleton that can be used for cameras, lights and any number of the various devices and accessories that have adopted the mounting design. Plastic zip-ties are used to connect the kit to the drone. The designer points out that the mounting points work well with Knog Qudos lights because of their small, but powerful, lights and GoPro mounting ports. The EXO 1 can be equipped with a novel but simple payload system. Using carabiners and neodinyum magnetics, the drone can lift a small payload and deliver it to a person without landing — just pull to release the payload from the magnet. This exoskeleton was part of a design contest sponsored by DJI and Shapeways, no doubt to show the versatility of the Phantom 4 and Shapeways 3D-printing service. 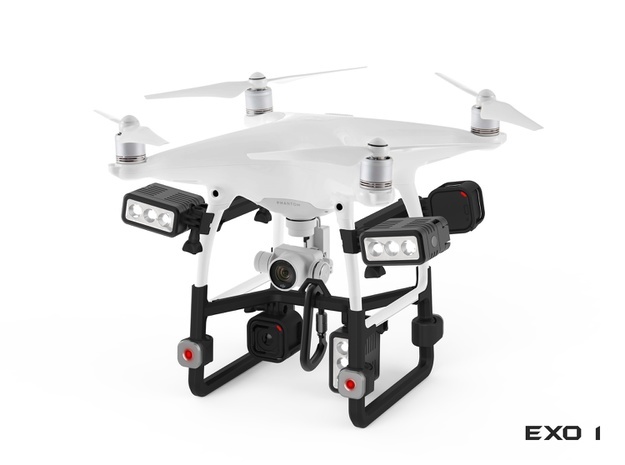 The EXO 1 won the contest, netting the designer $1,000 and a Phantom 4 drone. The EXO 1 is currently available for ordering from Shapeways for $113.